Nigel Farage is co-founder and long-serving leader of the UK Independence Party (UKIP). He was the face of the successful campaign to take the UK out of the European Union in the 2016 Brexit referendum, positioning the referendum as the start of a global populist wave against the political establishment. In September 2016, Farage stepped down as leader of UKIP after 15 years. Writing in The Spectator, the journalist Rod Liddle described Farage as ‘the most important British politician of the last decade and the most successful’. 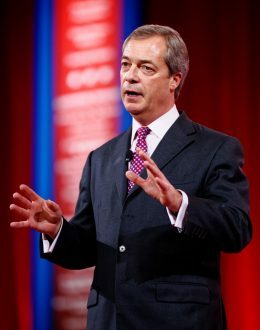 Farage has become the great “disruptor” of British and European politics and is widely consulted for his views on the changing nature of western politics. He was shortlisted for TIME Magazine’s 2016 Person of the Year, but was beaten by Donald Trump. He won the Lifetime Achievement Award at the Spectator’s 2016 Awards. He has formed a close personal relationship with President Trump having spoken at his election rally in Mississippi. He was ranked second in The Daily Telegraph’s Top 100 most influential right-wingers poll in 2013, behind Prime Minister David Cameron, he was also named “Briton of the Year” by The Times in 2014. In 2010, Farage published a memoir, entitled Fighting Bull (Flying Free), outlining the founding of UKIP and his personal and political life. A second book, The Purple Revolution: The Year That Changed Everything, was released in 2015.